You are at:Home»Herbs»Calotropis gigantea R.Br. Latin name : Calotropis gigantea R.Br. Description : The dried root bark has abortifacient, alterative, anthelmintic, antiinflammatory, antispasmodic, bitter, depurative, digestive, emetic, expectorant, febrifuge, laxative, stomachic and tonic properties that relieves strangury, cures ulcers and acts as an expectorant. It is also used in enlargement of spleen, asthma and dysentery. Calotropin, extracted from the roots, has been found to be effective in fertility control as it inhibited the motility of sperms. Its leaves are used to relieve stomach pain and used in oedema and enlargement of the abdominal viscera. The flowers are anthelmintic, appetiser, astringent, bitter, digestive, stomachic and tonic, that cure piles, asthma, loss of appetite and wounds and are useful in cholera. Externally it is useful in rheumatism, paralysis and gout. 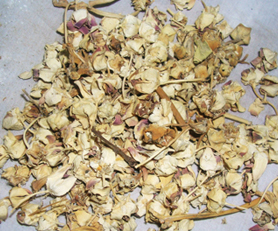 Recommended Dosage : Dried Flower : 125 mg to 375 mg powder; Leaf : 250 mg to 750 mg powder; Root Bark : 250 mg to 1 g powder. Contraindication : The root is contraindicated during pregnancy. Higher doses may cause vomiting, diarrhoea, bradycardia and convulsions.